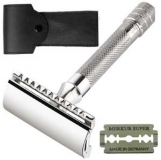 MERKUR safety razors consist of chrome-plated die-casted zinc or brass parts. The constant contact with water and soap leads to the deterioration of the materials. 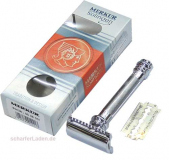 The use of the razor over a long period of time is only passible with regular maintenance. 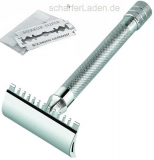 With each blade exchange the razor parts should be cleaned with a soft brush (such as a nail brush) and warm water. If the razor is not used daily, please follow these recommendations at least once a week, or before you store the razor away. Threads and adjustment mechanisms should be moved regularly, so they will remain movable. Movable parts can be oiled occasionally. For this, please use small amounts of paraffin oil, weapons oil or other machine oil that is acidfree and nonresinous (DO NOT use edible oil!). During the handling please take care not to over tighten the screws. 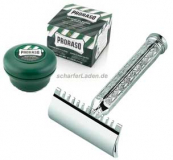 Shaving soaps have a large fat content. 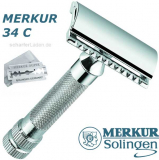 For cleaning away scaling, the disassembled razor should be placed in a solution (1:1) of water and a fat solvent such as dish detergent or hair shampoo. 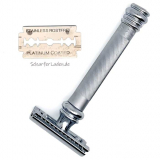 It is possible that the razor needs to soak in this solution for several days and has to be moved around in it occasionally. 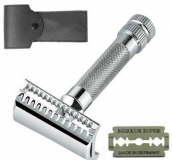 When even several of such applications do not lead to success, the razor unfortunately is irreparable. 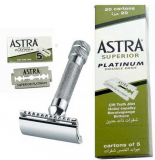 Stains on the surfaces of the razor can also be removed with the above mentioned fat solvents. In contact with hard, limy water, all razor parts need to be decalcified regularly, either with a customary decalcifying agent (such as one for coffee machines, etc.) according to their instructions for use, or with a diluted lukewarm vinegar solution (max. 30°C/86F), into which the parts should be placed no longer than 30 minutes, and occasionally moved around in the solution. Longer exposure to the vinegar/decalcifying agent will corrode the surface chrome and the metal underneath. Torsionsmodell bedeutet: Der Kopf ist in sich etwas verdreht. 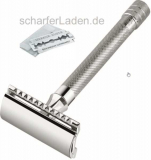 Dadurch steht die eingelegte Klinge ein wenig schräg zum Griff. Bei starkem Bartwuchs ergibt sich daraus eine gründlichere, wenn auch weniger sanfte Rasur. Einstellbar bedeutet: Durch Drehen der Schraube am Griffende lässt sich der Abstand der eingespannten Klinge zur Schaumkante variieren. Das Rasurverhalten in Abhängigkeit vom Klingenspalt ist ein Kompromiss: je kleiner der Spalt, desto schonender -- je größer, desto gründlicher die Rasur. So kann je nach Hauttyp und Bartstärke, aber auch nach aktuellem Hautzustand eine entsprechende Einstellung gewählt werden. Eine Numerierung ermöglicht ein zielgenaues Justieren.